Just two days after Veteran’s Day, Congressman Seth Moulton has introduced a series of bills aimed at addressing the therapeutic use of marijuana among veterans. While Rep. Moulton’s bills do not address the core issue of the inability for VA doctors to fill out state-legal medical marijuana recommendations it does address the uncertainty of VA policy when it comes to a veteran’s ability to have an honest conversation with their doctor. The Department of Veterans Affairs Policy for Medicinal Cannabis Use Act of 2018. This bill would amend and codify a medicinal cannabis policy the VA has but is not widely disbursed. As more veterans turn to medicinal cannabis to more effectively treat their various service- and non-service related injuries, the relationship with their healthcare providers is becoming ever more important. The VA has a policy protecting a veteran’s benefits if they discuss their medicinal cannabis use with their health care provider; however, not all healthcare providers respond in a standard way and veterans still fear and experience repercussions of some kind. This bill clarifies and codifies patients’ and healthcare providers’ roles and responsibilities in incorporating medicinal cannabis into a patient’s treatment plan and requires the policy to be prominently posted in all VA facilities. The Department of Veterans Affairs Survey of Medicinal Cannabis Use Act of 2018. This bill would have the VA conduct a nation-wide survey of all veterans and VA healthcare providers to learn about how veterans are using medicinal cannabis. 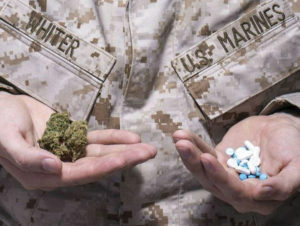 From the American Legion’s survey on medicinal cannabis, “22 percent of veterans stated they are currently using cannabis to treat a medical condition and 40 percent of caregivers stated they know a veteran who is using medical cannabis to alleviate a medical condition.” With the growing use of medicinal cannabis among veterans, the VA needs a better understanding of what veterans are doing to self-medicate various conditions. The Department of Veterans Affairs Medicinal Cannabis Education Act of 2018. This bill would partner the VA with medical universities who have incorporated medicinal cannabis education into their curriculum to develop continuing education programs for primary healthcare providers. While these bills would make commendable advances if passed by Congress, they fail to include the fix most needed of VA policy, which would be to allow VA doctors to fill out the necessary state-legal medical marijuana recommendation form in the 33 states that now have laws governing the therapeutic use of cannabis. There are two pieces of legislation currently pending which would address that currently pending in the House and Senate. They are The Veterans Equal Access Act in the House carried by Congressman Earl Blumenauer (D-OR) and The Veterans Medical Marijuana Safe Harbor Act in the Senate carried by Senators Bill Nelson (D-FL) and Brian Schatz (D-HI). You can contact your federal lawmakers in support of medicinal cannabis policy reform to support veterans by clicking here.